An exclusive credit card which rewards you on travel spends, fine dining and compliments your premium lifestyle with the best reward point value. Enjoy up to INR 10,000 cash back* on MakeMyTrip. Just book your tickets within 90 days of card issuance and get the cash back on a single transaction. Enjoy reward value of 1 Re for every reward point. Annual fee of INR 5000. 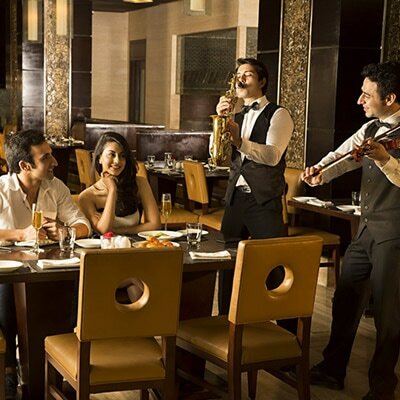 Up to 25% discount* at top 250 restaurants in India with advance reservation via concierge & online booking. For more details, visit scb.dineout.co.in. See Terms and Conditions. Access 20 premier golf courses in India and 150 worldwide. Enjoy 24X7 access to the Ultimate Concierge helpline. Simply call 18001023586/ 912242320262. See Terms and Conditions. Extend the benefits of your credit card to your family members by getting them lifetime free Supplementary credit cards. Enjoy faster checkouts, secure payments and complete freedom from cash, when you transact with a contactless credit card. Now enjoy enhanced security for online transactions on your credit card through 3D secure OTP verification. Check your card balance and make convenient and instant card payments via online banking and Standard Chartered Mobile. Convert your big spends above INR 5,000 to easy EMI with Kuch Bhi on EMI through online banking or SC Mobile. Enjoy attractive pricing and flexible tenure options. Get loan on your credit card upto INR 5,00,000. Flexible tenure from 12 to 60 months. Transfer card balance upto INR 5,00,000 from other bank credit card at attractive interest rate. Convert your entire outstanding (upto INR 5,00,000) into EMIs. Zero processing fee. What are the features of Ultimate Credit Card? Travel and Air Accident Cover up to ($ 200K).& Medical Travel Insurance up to $ 25K. What is the annual Fee on the same? Will I get the MMT benefit every year? I am already on the free version of the Visa Infinite card- can I upgrade to the Ultimate credit card? Yes, you can, please call Phone Banking for the same. What is the age limit for availing medical insurance? What is the concierge program and what can the customer use it for ? What is the dining program and how can the customer use it ? What is the condition for free lounge access ? The domestic / international lounges under the Priority Pass program are complimentary only 1 visit per month. The qualification is customer should have spent more than INR 20,000 in the previous calendar month of the visit.